The name Pearl (パール) was given by Konishi Honten and Konishiroku Honten (the later Konica) to many models of rollfilm folders. This article deals with the early models taking both film plates and rollfilm. See also the Pearl No.2, self-erecting 6×9 Pearl, the 4.5×6 Semi Pearl, Pearl (I), II and III and Pearl IV, and for 127 film, the Baby Pearl and Pearlette. 4.2 Advertisements for a "Pearl Kodak"
All the models are vertical folders, and none is self-erecting: the front standard has to be pulled out manually after the folding bed is opened. They have a mixed construction, with a wooden main body and a folding bed made of metal. All the cameras have focusing rails, a distance scale on the photographer's left and a leather handle at the top. The back is detachable as a whole for film loading; its center part contains a single uncovered red window, and can be replaced by a ground glass holder or plate holders. The film spools are loaded in removable metal inserts, complete with film rollers. The name The Pearl is inscribed on a round nameplate attached to the photographer's left, except perhaps on the earliest cameras (see below). The first generation body, sold from 1909, has the advance knob at the bottom right (as seen by the photographer), a PEARL nameplate at the bottom of the front standard, a rectangular folding bed and straight struts. It was only sold in tefuda-size, under the names "Pearl Hand Camera No.3" (with single extension bellows and simple vertical movements) and "Pearl Hand Camera No.4" (with double extension bellows and geared vertical movements). A single surviving example has been observed (item 1107 of Sugiyama). The second generation body has a newer folding bed with an arched end, and slightly different struts. It still has the advance knob at the bottom right and the PEARL nameplate on the front standard. On the models with double extension bellows, the folding bed has a cut-out to allow the movement of the standing leg, which is attached to the focusing tray. The second generation body was perhaps first announced in 1911 as the "Minimum Pearl" in tefuda-size, but this name quickly disappeared, and the camera's official name evolved at some time from "Pearl Hand Camera No.3" or "No.4" to "Pearl No.3" or "No.4". The camera was also briefly sold under the name "Pearl Kodak" around 1914, and the hagaki-size models appeared at about the same time with this body type. A single surviving example is known, in tefuda-size, identified as a "Minimum Pearl" in an article in Camera Collectors' News. The third generation body, perhaps made in tefuda-size only, has the advance key at the top left, no nameplate on the front standard, and a rectangular folding bed again. At some time, the thin struts were replaced by wider parts. This body exists with single or double extension bellows. It was perhaps offered from the mid-1910s as a cheaper alternative to the Special Pearl, and apparently survived until the release of the Pearl No.2 in 1923. The Special Pearl, released in 1913 and available with double extension bellows only, has a completely different front standard built around a U-shaped metal part, and a new focusing mechanism. Some examples, but perhaps not all, have a Newton finder added to the side. The tefuda and hagaki-size models markedly differ by the shape of the lensboard and the position of the brilliant finder: to the side on the smaller camera, at the middle on the larger one. The newer front standard of the Special Pearl was adopted at some time on the late hagaki-size model with single extension bellows. The meishi-size model released in 1916 completely differs from the larger models, and only exists with single extension bellows. The original model was released by Konishi Honten in January 1909 as the Pearl Hand Camera (パール手提暗函). It was a copy of the No.3 Folding Pocket Kodak, but for tefuda (3¼×4¼ in.) format plates as well as 118 film. The front standard is similar to that of the original Lily Hand Camera. It mainly consists of two cylindrical masts, and allows horizontal and vertical movements. A hooded brilliant finder is perched atop the left-hand mast, and a bubble level is attached to it; the camera has no other viewfinder. The camera exists in two models, the No.3 (3号) and No.4 (4号). The Pearl No.3 and No.4 cameras made a few years later differ by the bellows extension and by the vertical movement mechanism; it is supposed that these features distinguished the two models from the start. The No.3 have single extension bellows and the No.4 have double extension bellows driven by a wheel on the photographer's right. For vertical movements, the No.4 have rack-and-pinion assemblies on each side of the front standard, driven by two small wheels, whereas the No.3 have smooth masts and a single arresting screw on the left-hand mast — as seen from the front. As a consequence, the No.4 looks very much like an original Lily with a removable back and spool compartments added at both ends. No.4, Carl Zeiss Tessar Ser.IIb No.4 lens (135/6.3),, Compound shutter, ¥135. The case was available for ¥3 extra. No.4, Carl Zeiss Tessar Ser.IIb No.4 lens (135/6.3), Koilos shutter, ¥115. All the prices are given for the rollfilm camera alone. The set of three double-sided plate holders and one ground glass holder was sold separately, for ¥4.50, and a case was available for ¥3 extra. Other lens and shutter options were certainly available, at the customer's request. At least one surviving example of the No.3 is known with the advance key at the bottom right and the older folding struts; it has a PEARL nameplate at the base of the front standard and it is perhaps missing the round nameplate on the side. Its lens is a Bausch & Lomb Rapid Rectilinear f/8 and its shutter only has T, B, I settings. Some Pearl cameras are distinguished by a different folding bed with an arched end. These retain some early features, such as the PEARL nameplate at the bottom of the front standard, and the advance key at the bottom right. These are arbitrarily grouped together in this section, as "second generation" cameras. The Minimum Pearl (ミニマムパール) was announced in March 1911. One source says that it was a "smaller, improved version of the 1909 Pearl [Hand Camera]", introduced together with the Minimum Idea. This model was reportedly advertised in Shashin Geppō, but this original advertisement has not yet been observed. No surviving camera has been clearly identified as a Minimum Pearl. The article by Kikuoka in Kurashikku Kamera Senka no.10 mentions a camera owned in the 1980s by the Konica company which is said to have some similarity with the original illustration. It also displays a small reproduction of a picture, which might show this surviving camera; this reproduction is too bad to elaborate further. An article by Andō in Camera Collectors' News shows a surviving Pearl camera, and says that it might correspond to the Minimum Pearl. Its identification is nonetheless unsure. A plausible interpretation is that the name "Minimum Pearl" was initially adopted for the newer "second generation" Pearl body, then the name was abandoned for some reason, perhaps because it was illogical for this large and expensive camera, and conflicting with that of the small and inexpensive Minimum Idea. Advertisements for a "Pearl Kodak"
Mention of a "Pearl Kodak" (パール、コダック) is found in at least two documents published by camera retailers. It is not known if this name was officially used by the Konishi company. The first document is a catalogue by the Mitsukoshi department store. The illustration shows a camera with the arched folding bed, the PEARL nameplate at the bottom of the front standard, and the film advance knob at the bottom right. 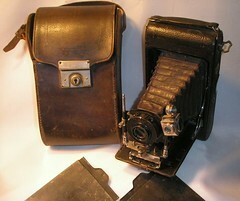 The bellows have single extension, and the front standard is the same as on the Pearl Hand Camera No.3. case for the plate holders, ¥2. The other document is a catalogue by the company Seikōdō, dated August 1914 and showing the same illustration. The text says that the camera is "the first Kodak made in Japan", certainly using the word "Kodak" in a broad meaning of "Kodak-like camera". The Pearl in hagaki-size takes 8×14cm pictures on 122 film or 8×10.5cm pictures on glass plates. Some sources say that the hagaki-size camera was first released as the Special Pearl in 1913 (see below), and that the Pearl No.3 followed in November 1914 and the Pearl No.4 in November 1915. The August 1914 document cited above showing the hagaki-size "Pearl Kodak" casts a different light. The most plausible theory is that the Pearl No.3 was already produced in hagaki-size by Summer 1914, and sold under the name "Pearl Kodak" for a few months. The release date of November 1914 for the hagaki-size Pearl No.3 is certainly based on the advertisement appearing in that month issue of Shashin Geppō. This document offers the camera for ¥38 with an Extra Rapid Aplanat lens and a Singlo shutter; a set containing the ground glass holder and three double-sided plate holders is listed separated for ¥6, the camera case is at ¥3.20 and the case for the plate holders is at ¥2. The advertisement shows an illustration of a Pearl camera with the arched folding bed, the PEARL nameplate at the bottom of the front standard, and the film advance knob at the bottom right. It has double extension bellows and vertical movements controlled by two small wheels, features which are supposed to be specific of the Pearl No.4. The folding bed has a cut-out to accommodate the standing leg, which certainly moves together with the focusing tray. The overall proportions are the same as on the tefuda-size surviving example mentioned below, and the illustration was perhaps mismatched in the original advertisement. The surviving camera presented as a hagaki-size Pearl No.3 in Sugiyama and in Kikuoka's article probably corresponds to a Special Pearl instead, without the Newton finder (see below). The surviving example pictured in the article by Andō in Camera Collectors' News mentioned above is very similar to the illustration of the hagaki-size Pearl No.3 in Shashin Geppō November 1914. The camera takes tefuda-size pictures, has double extension bellows, a Rodenstock Extra Aplanat f/7.7 lens and a Pronto shutter. This is the only surviving example of the "second generation" Pearl observed so far; its identification as a Minimum Pearl is unsure, and it might correspond to a Pearl No.4 instead. Pearl No.3, tefuda-size, Wollensak Voltas f/8 lens, Gammax shutter. The Pearl still appears in the advertisement in Ars Camera April 1922, also showing the "Lily" and "Idea A", with almost no detail. The illustration is laterally reversed, obviously a mistake in the advertisement. It shows a tefuda-size Pearl No.3 with the third generation body, probably indicating that the camera was offered as a cheaper alternative to the Special Pearl until the release of the Pearl No.2 in 1923. It is said that the Special Pearl (スペシャルパール) was released in May 1913, simultaneously in tefuda-size (8×10.5cm) for 118 film and in hagaki-size (8×14cm) for 122 film (it seems that both versions take tefuda-size plates only). However this early release date is not confirmed by any of the original documents observed so far. The Special Pearl has a newer front standard and double extension bellows with a revised focusing mechanism and a larger focusing wheel. (Similar features are found on the 1916 Lily No.2.) The front standard is built around a U-shaped metal part, with vertical and horizontal movement ability; the vertical movement is controlled by two small wheels on the sides. The brilliant finder is perched on the photographer's left on the tefuda model whereas it is attached to the middle of the lensboard on the hagaki model. The advance key is at the top left on the smaller model, and on the right on the larger one. All the surviving examples observed so far have an additional folding Newton finder on the side; however some advertisements for the Special Pearl show a camera lacking this feature. One source also mentions a Deltas f/6.8 lens for the tefuda-size model. At least two surviving examples of the Special Pearl are known in tefuda-size; one has an Auto shutter (T, B, 100–1) and the same hooded brilliant finder with bubble level as the regular Pearl No.3, the other has a Victo shutter (T, B, 100–10) and a smaller brilliant finder with no bubble level. One camera is known in hagaki-size, with a Newton finder, an Ilex Anastigmat f/6.3 lens and an Acme shutter (T, B, 1–300). The hagaki-size Pearl No.3 perhaps adopted some of the features of the Special Pearl at some time. One surviving hagaki-size camera, certainly corresponding to a Pearl No.3, is known with an Idea Anastigmat f/7.5 lens and a Victo shutter (T, B, 10–100). It has simple extension bellows and lacks the Newton finder but it is otherwise very similar to the hagaki-size Special Pearl; it notably has the newer front standard, albeit with a simplified mechanism for the vertical movement, only locked by an arresting screw on one side. The meishi-size Pearl No.3 (パール3号) was reportedly released in August 1916. It takes 6×9cm exposures on 120 film, and was the first Japanese camera to use this rollfilm type; it also certainly takes 5.5×8cm glass plates. The main body is mostly a reduced version of the tefuda model. However the focusing rails allow single extension only, and the front standard, made of pressed metal and very similar to that of the meishi-size Idea A, has no movement ability. The advance knob is at the bottom right, as seen by the photographer, and the pivoting brilliant finder is offset to the left. Surviving examples are known with Victo, Deltax or Gammax shutters. ↑ "Pearl" is written in roman script on most or all of these models. In Japanese, the line was and is called Pāru (i.e. the English word "Pearl" within Japanese phonology); the Japanese word for "pearl" is shinju (真珠), but this does not seem ever to have been applied to the camera. None of the cameras dealt with in this article was exported, and it is unlikely that any was either labeled or advertised with any roman script other than "Pearl" or "The Pearl". Thus the choice of names within this article is sometimes difficult. ↑ Release date: chronology from the official company history Shashin to tomo ni hyaku-nen, reproduced in Tanaka, p.94 of Kurashikku Kamera Senka no.10 (this document mentions postcard size by mistake); this is repeated in Kikuoka, p.24 of the same magazine, and in this page of the Center of the History of Japanese Industrial Technology. The date is simply given as 1909 in the chronology at R. Konishi Rokuoh-sha. ↑ The phrase tesage anbako (手提暗函) is rendered as "Hand Camera" in the Konishi catalogue dated December 1911. In modern sources, it is often translated as "Portable Camera" and the camera called "Pearl Portable". The Japanese word anbako literally means "dark box"; it was modeled after "camera obscura" and was used for cameras until around the 1910s. ↑ Copy of the No.3 Folding Pocket Kodak: Lewis, p.33. ↑ Advertisement reproduced in this page at R. Konishi Rokuoh-sha (at the top). ↑ The same versions are listed in Tanaka, p.25 of Kurashikku Kamera Senka no.10. ↑ 7.0 7.1 7.2 Lens features: December 1911 catalogue of Konishi Honten, pp.40–1. ↑ December 1911 catalogue of Konishi Honten, p.15. The advertisement reproduced at the bottom of this page at R. Konishi Rokuoh-sha is very similar to the catalogue entry, and gives the same price list. ↑ Example pictured in Sugiyama, item 1107 (where it is called "The Pearl III"). ↑ Chronology from the official company history Shashin to tomo ni hyaku-nen, reproduced in Tanaka, p.94 of Kurashikku Kamera Senka no.10; and Kikuoka, p.24 of the same magazine. ↑ Shashin Geppō is mentioned as a source in the table in Kikuoka, p.25 of Kurashikku Kamera Senka no.10. ↑ Kikuoka, p.24 of Kurashikku Kamera Senka no.10. ↑ Picture in Kikuoka, p.24 of Kurashikku Kamera Senka no.10. ↑ Document reproduced at R. Konishi Rokuoh-sha. ↑ 17.0 17.1 Kō (甲), otsu (乙), hei (丙) are the three first characters of a sequence used to count from one to ten. See this Wikipedia page. ↑ Document reproduced near the top of this page at R. Konishi Rokuoh-sha. ↑ The hagaki-size Pearl No.3 is said to take 8×10.5cm glass plates or 8×14cm pictures on rollfilm in Sugiyama, item 1110, where it is called "The Pearl (Meiji 44)". Film type is mentioned as 118 film by mistake, and this is repeated in McKeown, p.543, for the "Pearl (1911)". ↑ Kikuoka, pp.24–5 of Kurashikku Kamera Senka no.10. ↑ Advertisement reproduced at R.Konishi Rokuoh-sha. The illustration is also reproduced in this page of the same website. ↑ Example pictured in Kikuoka, p.25 of Kurashikku Kamera Senka no.10, and in Sugiyama, item 1110 (this is certainly the same). ↑ Illustration reproduced in this page at R. Konishi Rokuoh-sha, showing the 1914 tefuda-size Pearl No.3. ↑ Example pictured in Sugiyama, item 1106 (where it is called "The Pearl II" by mistake), and in this page at Neco's collection. ↑ Examples pictured in Tanaka, p.24 of Kurashikku Kamera Senka no.10, and in this page at Neco's collection. ↑ Example pictured on p.26 of Camera Collectors' News no.259. ↑ Example pictured in this page. ↑ Example pictured in Sugiyama, item 1108 (where it is called "The Pearl IV"). ↑ Example pictured in Tanaka, p.24 of Kurashikku Kamera Senka no.10. The lens engraving is very similar to that of the camera pictured in this page; this is why it is most certainly a Voltas. ↑ Chronology from the official company history Shashin to tomo ni hyaku-nen, reproduced in Tanaka, p.94 of Kurashikku Kamera Senka no.10; this is repeated in Kikuoka, p.24 of the same magazine. The date is simply given as 1913 in the chronology at R. Konishi Rokuoh-sha. The hagaki-size Special Pearl is said to take 8×10.5cm glass plates or 8×14cm pictures on rollfilm in Sugiyama, item 1109 (film type is mentioned as 101 film by mistake). ↑ Advertisements dated November 1918 (in Shashin no Shumi) and February 1922 (in Shashin Geppō) reproduced in this page at R. Konishi Rokuoh-sha. ↑ Advertisement reproduced in this page at R. Konishi Rokuoh-sha. ↑ Documents reproduced in this page at R. Konishi Rokuoh-sha. ↑ Examples pictured in Kikuoka, p.25 of Kurashikku Kamera Senka no.10. ↑ Example pictured in Kikuoka, p.24 of Kurashikku Kamera Senka no.10, and in Sugiyama, item 1109 (this is certainly the same). ↑ Kikuoka, p.25 of Kurashikku Kamera Senka no.10. ↑ Victo: example pictured in this page of Neco's collection. Deltax: example pictured in this page of the same website. Gammax: example pictured in Kikuoka, p.25 of Kurashikku Kamera Senka no.10. Andō Yoshinobu (安藤嘉信). "Minimamu Pāru no nazo" (ミニマムパールの謎, Minimum Pearl mystery). In Camera Collectors' News no.150 (December 1989). Nishinomiya: Camera Collectors News-sha. Ars Camera. Advertisement by Konishiroku Honten in April 1922. No page number. The Japanese Historical Camera. 日本の歴史的カメラ (Nihon no rekishiteki kamera). 2nd ed. Tokyo: JCII Camera Museum, 2004. P.6. Kikuoka Sei (菊岡清). "Konica history 3. Meiji 41-nen – Taishō 12-nen." (Konica history 3. 明治41年–大正12年. From Meiji year 41 (1908) to Taishō year 12 (1923).) Kamera Rebyū: Kurashikku Kamera Senka (カメラレビュー クラシックカメラ専科) / Camera Review: All about Historical Cameras no.10, September 1987. No ISBN number. Konishiroku kamera no rekishi (小西六カメラの歴史, special issue on Konishiroku). Pp.24–32. Konika-Minoruta-ten (コニカミノルタ展, Konica Minolta exhibition). Exhibition catalogue. Tokyo: JCII Camera Museum, 2005. Konishi Honten. Saishin Shashin Kikai Mokuroku (最新写真器械目録, Latest catalogue of photographic apparatus). Published on December 18, 1911. Recent reprint. Lewis, Gordon, ed. The History of the Japanese Camera. Rochester, N.Y.: George Eastman House, International Museum of Photography & Film, 1991. ISBN 0-935398-17-1 (paper), 0-935398-16-3 (hard). Pp.21 and 33. McKeown, James M. and Joan C. McKeown's Price Guide to Antique and Classic Cameras, 12th Edition, 2005-2006. USA, Centennial Photo Service, 2004. ISBN 0-931838-40-1 (hardcover). ISBN 0-931838-41-X (softcover). P.543. Sugiyama, Kōichi (杉山浩一); Naoi, Hiroaki (直井浩明); Bullock, John R. The Collector's Guide to Japanese Cameras. 国産カメラ図鑑 (Kokusan kamera zukan). Tokyo: Asahi Sonorama, 1985. ISBN 4-257-03187-5. Items 1106–10. Tamura Hiroshi (田村寛). "Nichiro-sensō ato no shashin seihin to fukyū" (日露戦争後の写真製品と普及, Diffusion of photography and photographic products after the Russo-Japanese War). 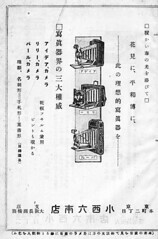 Shōwa 10–40nen kōkoku ni miru kokusan kamera no rekishi (昭和10〜40年広告にみる国産カメラの歴史, Japanese camera history as seen in advertisements, 1935–1965). Tokyo: Asahi Shinbunsha, 1994. ISBN 4-02-330312-7. Pp.40–3. Tanaka Yoshirō (田中芳郎). "Meiji–Taishō jidai no Konishi Honten no kamera wo shiru tame no hon" (明治・大正時代の小西本店のカメラを知るための本, Books about the Konishi Honten cameras of the Meiji and Taishō eras). Kamera Rebyū: Kurashikku Kamera Senka (カメラレビュー クラシックカメラ専科) / Camera Review: All about Historical Cameras no.10, September 1987. No ISBN number. Konishiroku kamera no rekishi (小西六カメラの歴史, special issue on Konishiroku). Pp.92–4. Advertisement for the "Pearl Kodak"
This page was last edited on 29 January 2019, at 19:13.